Slavery in the north was never the major force it was in the south, but there were still tens of thousands of slaves who lived, worked, and died on what we now think of as "free soil." It was especially prevalent in areas that were first settled by the Dutch, from New York Harbor up the Hudson River. In what is now Brooklyn, for example, more than 60% of white families owned slaves in 1790, with an average of 4.5 slaves each. In Queens and Staten Island, the ownership rate was about 40%, averaging 3 slaves each. And the decline of slavery over the next few decades was quite gradual, especially in New York and New Jersey. Cartographically, this is a stark example of the limitations of the usual county-level data. Compare this map to something like this, which is the best I could do at the county level. 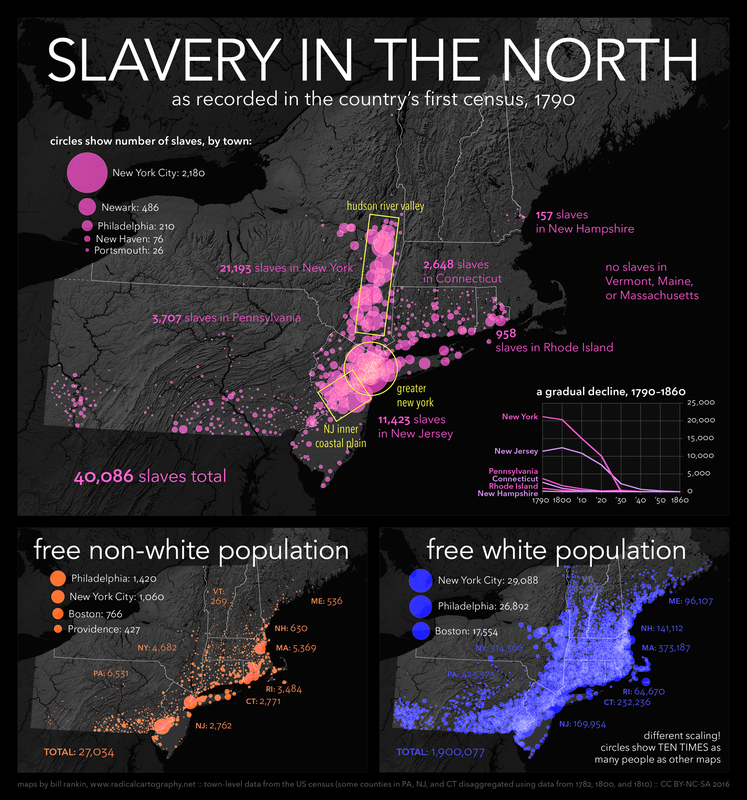 Notice how it's impossible to see the most important patterns along the Hudson or the magnitude of slavery around New York City. It's also impossible to understand what's happening in the huge counties just opened to white settlement. Town-level data is only available for the north, and complete coverage requires some interpolation from other data, but as far as I can tell it has never been mapped before — or even digitized. Data from the US Census and Heads of Families at the First Census of the United States (Washington: USGPO, 1908). As always, historical census data should be taken with a grain of salt. Note that a few "locations" in northern New Hampshire could not be placed. If you'd like the full spreadsheet of all 1,600 towns, just send me an email. • Areas without data — such as far western New York, or the Northwest Territory — were not uninhabited. There were certainly American Indians, and probably some white settlers as well. • Just because an area reported no slaves does not mean that no slaves were present. In Vermont, for example, slavery persisted under the radar for some time. • There are many reasons why the census might have undercounted some groups: the poor, free people of color, fugitives, etc. And the census — and the Constitution — explicitly excluded "Indians not taxed."